Last time I showed you a few of my favorite background techniques. So you got some color down… now what? 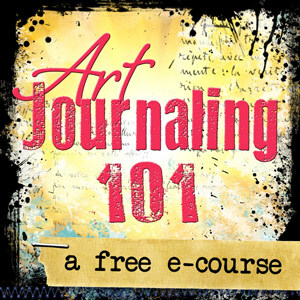 If you’re new to art journaling, or creating in general, here’s where it’s easiest to get stuck. 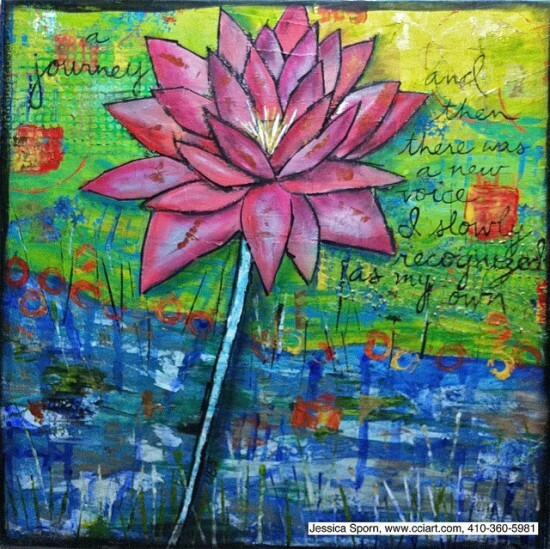 So today, I want to share with you a few examples of different ways you can add a focal point to your art journal page. I share these with you, not so that you feel the need to make your pages look like these, but to lay out some options for your heart to call you towards when you’re in the moment of creating. 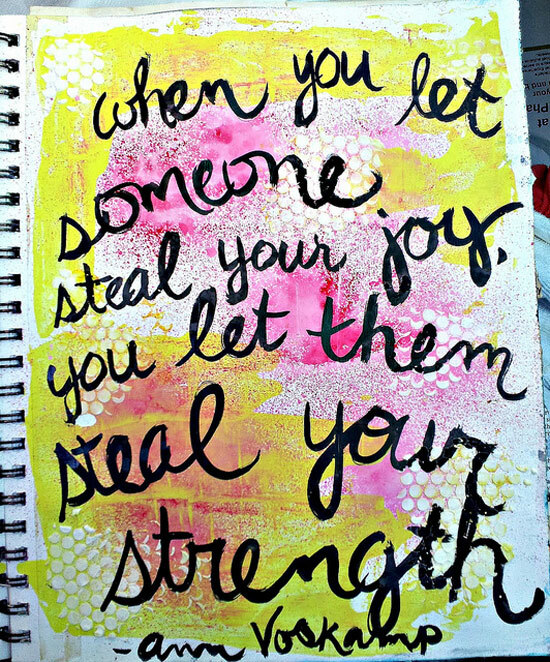 The more you practice in your journal, the more your heart will know what brings it joy; the more your heart will have confidence to steer you in the right direction in expressing yourself. 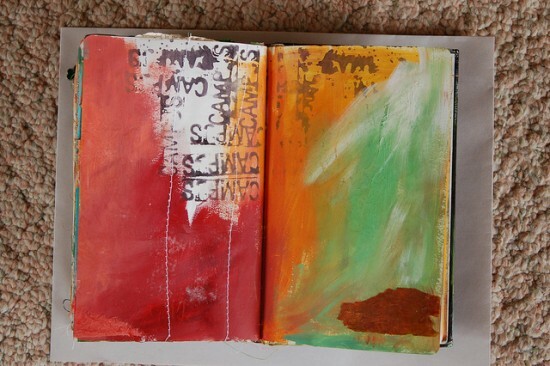 And remember, art journaling pages don’t have to look beautiful or even finished. It’s all about getting out what needs to be expressed in the moment, no matter how pretty or messy. The first and probably most obvious idea is to use a large focal image like these ladies have done here. 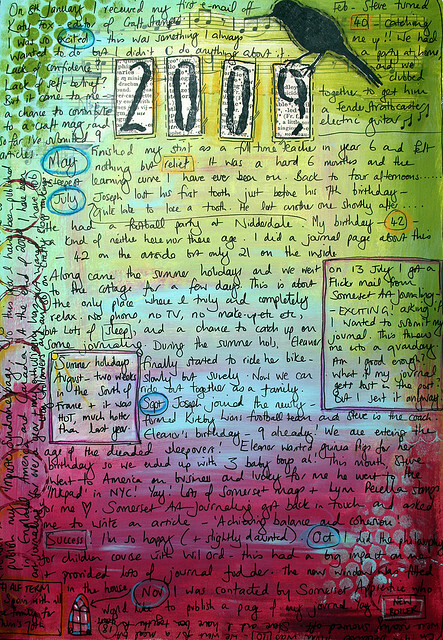 Or, you can use your journaling to fill the page like Paula and Kate did. Sometimes just a simple quote can be pretty striking too. If you’re in the mood to doodle, black doodles look great over a colored background! 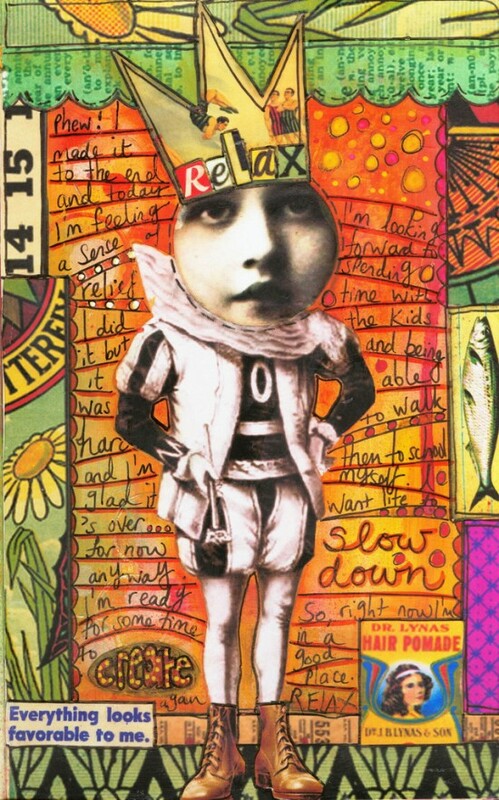 Putting a collage together with magazine clippings and photographs is a fun way to add bold imagery. But sometimes all you need is one simple word to make a real statement. And on rare occasions… the background itself just feels finished. I hope these have sparked at least one idea for you today! 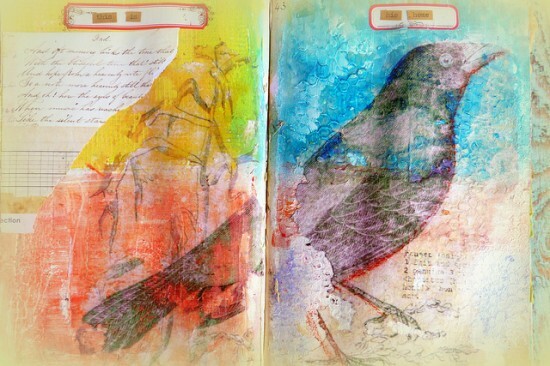 Just remember to have fun in your art journal. It’s all about expressing yourself, not about creating a beautifully appealing page. Enjoy the process! Oh I love these, yes I was stuck on the top layer as well thanks for the post! These were so wonderful to see! 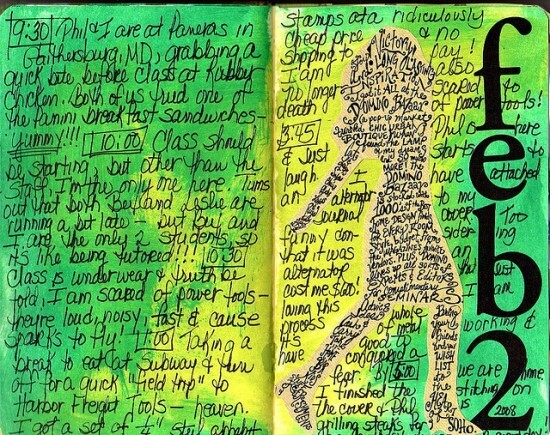 Very pretty examples of journaling! Great to see what’s possible! TY! Thanks for including my page! So appropriate how you led into it too, because it is exactly what happened! I made a background and then decided, nope, doesn’t need anything else! Hi Kristin – thanks for including my page in your post. I only just realized it so sorry to be late to thank you! Just signed up for your email and look forward to visiting often. 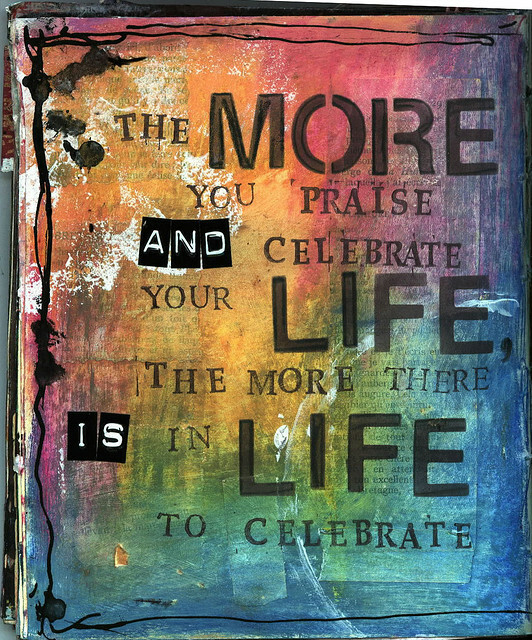 Thank you for all the wonderful ideas and support in creating Art journals! This is a super helpful post for a newbie like me who doesn’t quite know where to start. Thanks! Well, I tend to create a lot of pages with different backgrounds (rubber cement & watercolors, collage & watercolors, smeared crayons, doodeling etc. ), but then it is really difficult to start and “CREATE”. 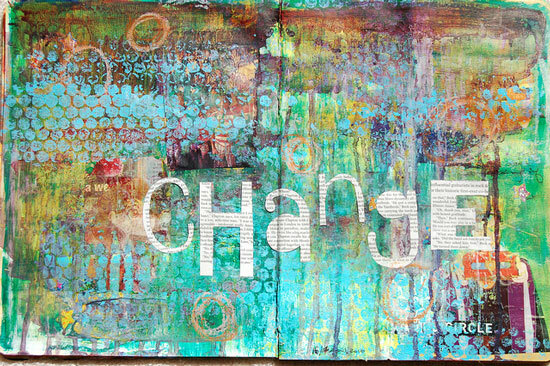 Kristal…Thank you so much for the few lessons and a way to create Art Journaling.. sometimes we just need a push and see where it leads us.. I made my first Art journal in three days. What a whirlwind. I had three days to complete it because I am giving it to my daughter who is traveling to Asia for four months. She loves journals so I thought I could make one. Your ideas has helped me so much. I was afraid of the blank page and not knowing what I was doing. I had ten watercolor gesso pages to fill which are 11 by 9 I think. I decided to create my own for lack of time and money and to make sure I liked doing it and I do. :). I just have a couple of questions. Is it necessary to apply a medium over your finished work? I did do this on a couple of pages. I was thinking I might add some more things. And still can’t find a good pen to use to write on it. WooHoo! Happy dance! 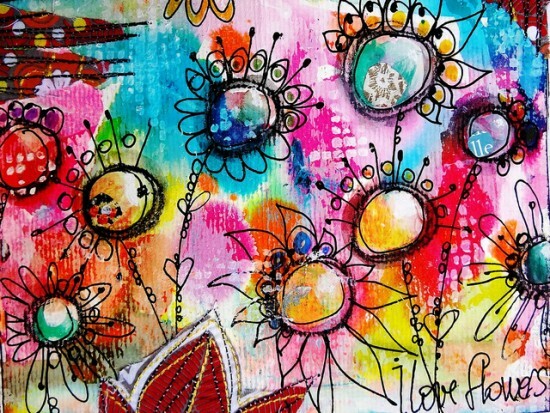 Congrats on finishing your first art journal! You shouldn’t need a sealer, unless you used a loose medium like chalk or something. Or, if your pages are sticking together. Other than that, no sealer should be needed. :) As far as a pen… that’s a toughy! Some work, some don’t; you just need to experiment. I tend to use Pitt pens, as they’re more like a marker. Hope that helps! Great inspiration. Thankyou. Really enjoying the course ? Wow! Just what I needed! I’ve been postponing page 1 but now I know how to start. I’m more of a pencil and ink guy, though. Thanks for taking the time and effort to concoct this marvelous course! Thanks, this post sparked a few ideas.